As a collaboration between FRIB and the MSU College of Engineering, the MSU Cryogenic Initiative will combine classroom education with training on the cutting-edge technologies and advancements in the cryogenic field that will exist at FRIB. a method of (extreme) preservation. The demand for cryogenic engineering support has increased rapidly in the last decade, and having FRIB at a world-class educational institution (MSU) opens a unique opportunity to fill the national need to educate and train the next generation of cryogenic system innovators. Helium cryogenic systems are a critical part of modern particle accelerators using superconducting radio frequency cavities and/or superconducting magnets. These systems are very complex, unique and involve very energy intensive processes. Traditionally, many of the key components have been adapted from other industries. As such, this requires an understanding of both the component details and how to integrate components into sub-systems, and sub-systems into the overall helium cryogenic system. The desired result is an efficient, reliable, and maintainable system supporting different modes of operation. There are also many opportunities for advancement and efficiency improvement because inefficiencies can be magnified by several orders of magnitude in highly energy-intensive processes. In a growing climate of environmental stewardship and non-renewable resource awareness, an efficient and flexible process design that results in an optimum balance of system reliability and capital cost is essential. The university environment coupled with FRIB provides a unique synergy among the students, faculty, and staff. 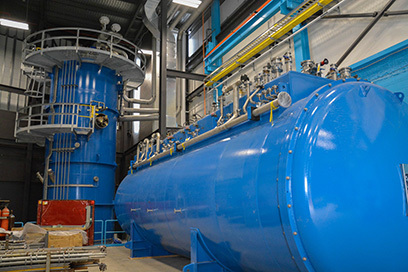 The advanced and unique cryogenic systems developed for FRIB places them at the forefront for large 2-Kelvin systems applied to particle accelerators. MSU presently has and is in the process of installing a substantial amount of state-of-the-art infrastructure, ranging from small helium systems to the large 2-K plant supporting the new FRIB accelerator. This equipment, combined with accelerator staff and the university engineering and physics programs, provides a wide range of fertile learning opportunities for students interested in the many aspects of cryogenic engineering. Having a large physically situated accelerator on a university campus, like FRIB on the MSU campus, is an ideal venue for educating the next generation of scientists and engineers working with advanced particle accelerators. It offers a unique and critically needed opportunity for hands-on training in research, engineering, design, and operations of cryogenic systems on a scale hard to create at other locations. In addition, this initiative is intended to be a repository and a focal point to collect and communicate best practices in the design, project execution, and operation of helium cryogenic systems. The vertical upper and horizontal lower cryogenic cold boxes are now installed at FRIB. The cold boxes will cool helium to an extremely low temperature, which will make the cavities within the cryomodules superconducting in FRIB’s linear accelerator tunnel.